Tommy was a formerly with Kilmarnock and Albion Rovers. He became the second United player in the 1959-60 season to record a hat-trick on his debut. Crucially, he scored the only goal of the game against Berwick Rangers on 30th April 1960 to promotion. Tommy was re-signed for the First Division campaign of 1960-61 and started the season in good form but dropped out of the side and spent the latter months in the reserves before he went to Tranmere Rovers for around £1,000. Tommy returned to Scottish football in 1962 to play for Dumbarton, Stenhousemuir and returning to Albion Rovers to finish his playing career. 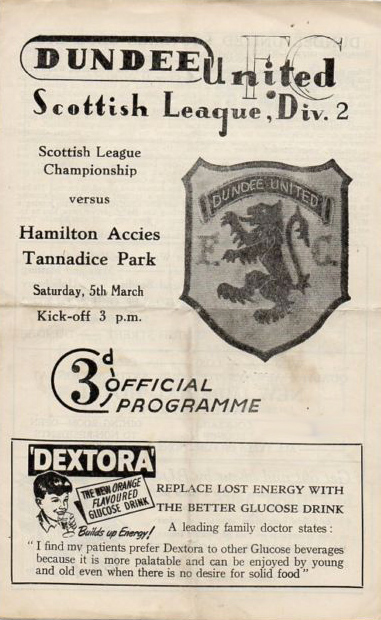 Fellow promotion contenders Hamilton were faced by a United side strengthened by new signings Tommy Campbell from Albion Rovers and Gibby Ormond from Falkirk for the vital clash. And Ormond took little time to settle by giving United a 5th minute lead. Not to be outdone Campbell added another in the 25th minute and completed a great debut hat-trick in the second half with Jim Irvine netting United's other goal. Hamilton, with someone by the name of JIM McLEAN in the No. 7 shirt, scrambled a late consolation goal from McPike.